Java applications traditionally used technologies like JDBC (Java Database Connectivity) to access relational databases in order to store data persistently. The main problem was the difference between object-oriented and relational technologies. JDBC API would require developers to hand-code the most primitive CRUD (create, read, update, and delete) operations in SQL which lacked portability. Additionally, the code was totally SQL dependent which is not a standard specification for relational databases, which would make the transition from one database to another more difficult. The problem is relational technology is focused on data and its relationship, whereas the object-oriented paradigm emphasizes not just on data but also operations performed on it. This results in the object-relational impedance mismatch. One solution that’s widely accepted is object-relational mapping (ORM). Hibernate is an ORM (Object/Relational Mapping) framework for the Java programming language that is concerned with data persistence. It simply is an open-source object-relational mapping solution that maps Java classes to database tables in relational databases and from Java to SQL data types. It is a lightweight ORM framework distributed under GNU license that aim to provide developers with a transparent mechanism to achieve persistence. It uses a powerful query language similar to the SQL called the HQL (short for Hibernate Query Language), which swiftly integrates with both existing and new applications without changing the rest of the application. Plus, it is fully compliant with object-oriented notions like inheritance, polymorphism, and association. And the best part, it does not require you to modify the application class to achieve persistence. The Java Persistence API, or JPA, is a specification that describes the interface for the object-relational mappings and persistent object management. Beyond the API definition, it defines the set of rules and guidelines on how to implement the object relational mapping and how to make these specifications compliant with all the JPA providers. Hibernate is the most advanced and widely used ORM implementation of JPA guidelines. JPA simply provides the object/relational mapping platform for managing data between Java objects/classes and a relational database in Java applications. It’s an interface specification designed for the JPA implementation vendors to create a standard for ORM implementation in order to target high-performance data access layer requirements. 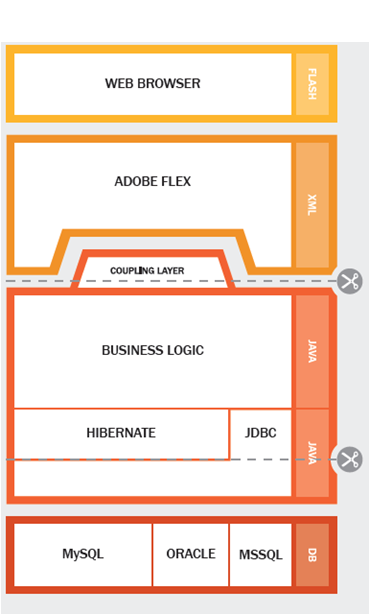 Hibernate is the most popular JPA vendor. JPA, short for Java Persistence API, is a specification for accessing, managing and persisting data in applications using Java Platform, Standard Edition (Java, SE) and Java Platform, Enterprise Edition (Java, EE). Hibernate, on the other hand, is more of a tool for ORM implementation that is compliant with JPA specifications. JPA is a specification for object-relational mapping in Java that allows developers to perform database operations much faster and efficiently thereby allowing for easy interaction with databases. It is the standard API for persistence and object relational mapping providing several advantages to the developers for data-binding operations. Hibernate is an open-source Object relational mapping tool that simplifies the development of Java applications to make connecting to databases much easier than ever. The problem with JPA is that it’s just a specification which doesn’t provide any implementation classes. The API is just a collection of classes and methods to store data persistently into a database following a specific set of rules and regulations that are to be followed by JPA vendors. Hibernate is one of the many JPA implementation vendors that implements JPA specification in any environment supporting JPA including Java SE and Java EE application servers. Besides being the most popular JPA implementation vendor, Hibernate framework retains its native API for promoting backward compatibility as well as accommodating no-standard features. Hibernate comes with several features that are not supported by the Java Persistence API such as extended identifier generators, new Date and Time API, repeatable annotations, steam query results, customizable CRUD statements, immutable entities, natural IDs support, ad hoc join of unrelated entities, etc. EntityManager is the standard for JPA specification implementation which is same across all implementations. On the contrary, if you want to use Hibernate API, then you would use Hibernate specific Session to handle persistence. However, you will not be able to migrate to a new vendor if you choose to use Session because it’s limited to Hibernate APIs. Almost all enterprise applications need some way to store data persistently. It’s vital to enterprise applications because of the required access to relational databases. Persistence is a fundamental concept in application development and is a challenge in itself because of the need to serialize the hierarchically structured Java objects to a database in a way that is both fast and efficient. While persistence has already been a hot topic of discussion in the Java community, many developers won’t even agree on the scope of the problem. In the context of object-oriented language, persistence means the data is still accessible even after the process which created it has ended. There are many ways to store data persistently. Hibernate is one such project that aims to provide a complete solution to the problem of persistence in Java, whereas JPA is a specification for managing persistent data and object-relational mappings. Sagar Khillar. 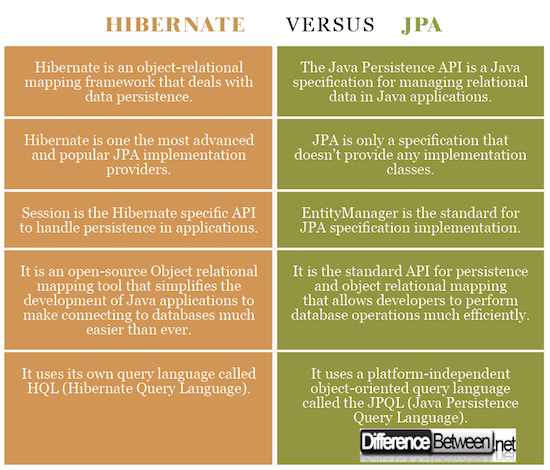 "Difference between Hibernate and JPA ." DifferenceBetween.net. March 26, 2018 < http://www.differencebetween.net/technology/difference-between-hibernate-and-jpa/ >. If you think, “we’re not likely to move away from Hibernate, so JPA isn’t important for us,” then think again. There are substantial differences between Hibernate 3.6 and Hibernate 4. There are even significant differences between Hibernate 5.1 and 5.2. Every time you upgrade, you’re effectively switching to a new persistence provider. By using a more stable interface like JPA, you can make upgrades much smoother.